The other boys don't do crack. Why do you do crack? That's not RIGHT! If you remember my N+1 post from some time back, you know that I have a mountain bike. It was cheap -- an no-badge eBay frame find that I nabbed for $2.35 plus $30 shipping. Oversized aluminum tubes, tig'd and painted, ready to rock, elevated chainstays... Reminiscent of the Nishiki Alien from the early '90s, minus the square down tube. The only new parts I had to hang on it were the stem and headset. Everything else I had as remnants from other bikes. I keep this one at work most of the time so I don't have to transport it back and forth, and I ride it during my lunchbreaks on Tuesdays and Thursdays. I've also had a lot of issues with the rear wheel, specifically flats. Lots of flats. I changed the tube, the rim strip, the tire, filed and Dremel'd the valve hole. No dice, still flat. The next step was a new rim. Eric, my training partner, volunteered to let me use another rear wheel. So I brought it home along with the bike today to be sure the wheel would work -- solid nutted axle, wide range gear cluster. I have an old road rear derailluer on the bike, so it can't handle a normal wide range of gearing. So as I was taking it out of the car at home, I noticed a dark jagged line on the down tube coming from the mid-tube weld. 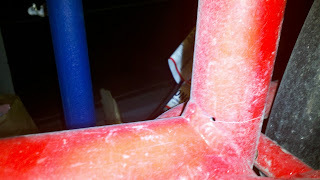 And another one on the seat tube at its mid-tube weld. I did the fingernail check, and sure enough, they're cracks. Big ones. 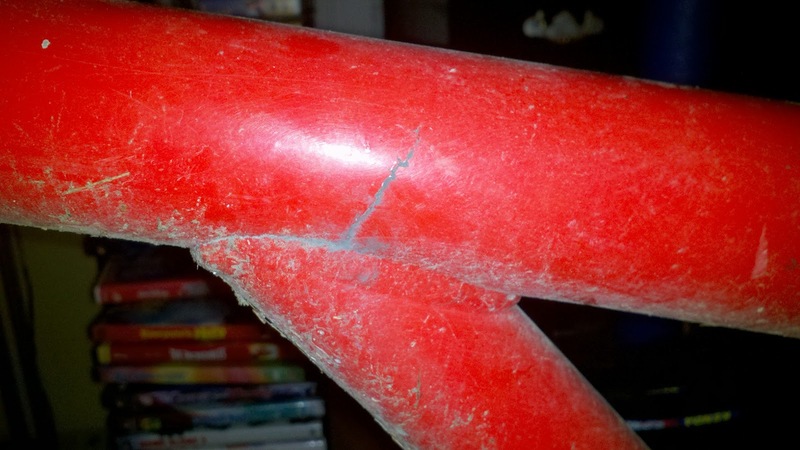 All this time that I was hearing creaking and thinking it was the bottom bracket, or the crankarms, it was probably these cracks growing. They're almost half-way around the tubes. Steel or titanium, it would be likely repairable. Aluminum? No go. This frame is now dumpster fodder, a gigantic paperweight. I've had 6 mountain bikes in my life. This is the third one that's cracked, the second aluminum one that's cracked. Of the others: One I gave away, one got left with an ex, the last was sold to a friend. Lesson? Well, I could say that I've learned to not buy aluminum MTB's, but the first one I had that cracked was steel. Or maybe it's that I need to not buy no-name MTB's off eBay. But it's given me well past my money's worth, and no other bike has cost me so little. I know one lesson is to inspect the frames more often, so I'm not alarmed to find a crack in my frame that's almost half way through a tube. That would be smart. Or maybe the lesson is that I need to have more than one MTB... Yeah, that's it. Always have a back-up. Much has been said for the use of 650 wheels on small frames -- often with the words "the only place they're useful". And I think that's just wrong. Usually the next few utterings will be of the many misconceptions regarding 650 wheels. 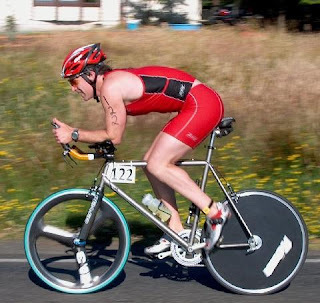 The fact is that the smaller wheels usually are found to only be useful on small-sized ROAD bikes, where toe overlap is a very real issue, but for tri bikes, the case can be made quite convincingly that 650's are useful, and maybe even necessary, for creating a stable-steering tri bike well up the frame size range. Part of the reason a road bike has stable handling is due to the weight distribution between the front and rear wheels -- approximately 55% or more of the rider and bike combined weight will be on the rear wheel if it's fitted properly. But a tri bike position can be loosely interpreted as a road bike position that's been rotated forward around the bottom bracket. What happens when you move forward? More weight on the front wheel. This is why a tri bike is often unstable-feeling compared to a road bike. Back in the day, when all we had were road bikes, and triathlons were in their infancy, we started to experiment with body position: long and low stems, arms sitting praying-mantis-style over the front wheel, saddles pushed as far forward as the seatpost would allow, or in extreme cases a seatpost that was bent forward. And the bikes handled like crap. It took some pretty relaxed arms (and a zen-like calm) to keep the bike in a straight line, or at least to not panic when it decided to grow a mind of its own. Dan Empfield and Ralph Ray simultaneously came up with similar ideas to remedy this problem, and while their philosophies were different (move the wheels forward vs move the bottom bracket back), they were arguing two sides of the same coin -- in order to tame the bike-handling beast of tri bikes, the rider's weight needed to be shifted onto the rear wheel. Here's the deal: When you start moving the wheels forward to compensate for the forward movement of the rider/bike center of gravity, there's only so far that rear wheel can move before it starts interfering with the bottom bracket. Sure, you could just move the front wheel farther out... But USAT has this pesky rule that says the front center can only go to 65cm, or 7/8 of the measured distance from the bottom bracket to the top of the saddle (measured 14cm behind the saddle nose), whichever is greater. So if you ride steep, and "steep" really starts at anything close to an effective seat tube angle of 80 degrees, you're gonna bump into that front center rule before you get to 55% of your weight on the back wheel. UNLESS... you use 650 wheels to allow that rear wheel to get just a little bit closer to the bottom bracket. Many of the tri bikes of yore sported the 650 wheel size, and in fact for a while it became THE identifying factor of a tri bike -- 650's were used across the size range for many makers, including some of the big swingers: Cannondale, Trek, Fuji, Klein, Kestrel... The list goes on. Manufacturers have gone away from using 650's for all but the tiniest of frame sizes, and have for quite some time, and I think that's a shame -- physics hasn't changed, and the resultant bikes they make aren't any more stable because they're made from ultra-bling carbon fiber. And this gets me to the search I went through several years ago when I was making my come-back into the tri world after several years away. Namely, finding a bike that would be stable given my preferred riding position. I'd been a triathlete before I became a bike racer (much like another famous guy who seems to like the color yellow), but I've never been anywhere near as fast. After racing for several years, settling into riding on a custom TiCycles Softride (which was never accepted for international bike racing, and sadly is no longer in production). I took a few years off to put my time into a business venture, and some life changes led me back to triathlon. I pulled out my other Softride (made by Paul Barkley) in my tri configuration, gave it a few rides, and realized that it just wouldn't do -- the handling was horrid. I read a lot. I checked all the dimensions and weight distribution on my bike, and realized its short-comings -- the geometry of the frame and beam, while awesome for road racing, and allowed for a wide range of seat positions, wasn't going to accommodate that wide range when it came to weight distribution. Too much weight on the front wheel. I determined the position of my center of gravity relative to the bottom bracket, and then overlayed that on the dimensions of every production frame I could find (it's great to have some multi-thousand dollar 3-D CAD at your disposal), and found that the SAME problem existed for every frame made at the time. And mostly it was because of chainstay lengths determined by 700c wheels coupled with the USAT limit on front-center. But I stumbled on a frame on the SlowTwitch classifieds using 650 wheels, and set up with a long-ish front center... and at a great price. Rumor was that it had been custom made for Scott Tinley some time back. It handles pretty well, even though it's still not quite where I'd like it to be. I'm quickly coming to the conclusion that the next frame I ride on will be one I make myself, with no regard for the USAT limit on front-center, sporting 650 wheels, and it'll handle like a dream. 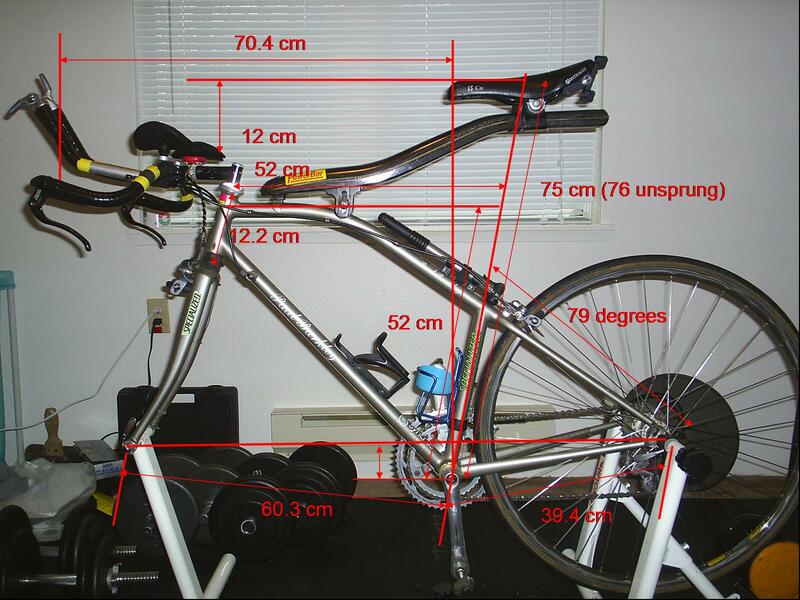 A while back I wrote a generalized piece on the basics of road bike fit, and how it's built from back to front. Tri bike fit has a different goal, and because of this, it has a different method of fitting, and is built completely backwards to that of a road bike fit. Yup, it's built from front to back. While road bike fit is about finding a weight balance on the bike, tri bike fit is about minimizing aerodynamic drag while keeping as much power transfer as possible, while balancing the limitations of flexibility and comfort. 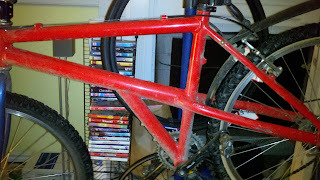 I'll get into weight balance in another post, as it feeds into frame geometry and how the bike handles as well. 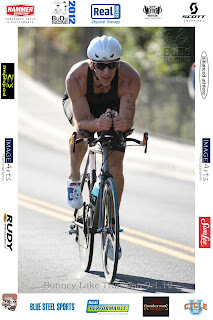 Articles and diagrams on SlowTwitch will often cite some ideal body angles saying that it is a classic triathlon fit. People will often regurgitate these angles when some one asks for a fit critique, overlaying them onto the picture of the person on the bike. And while this is typically a proper answer (ignoring the person's flexibility and physiology limitations), they don't go into WHY these angles are the classic fit. I'll take you through my own "front to back" fit process and where the limitations come into play. To start, put your hands up like you're a boxer protecting your face. They're probably very close together, maybe touching (good), elbows at about shoulder width, hands about level with your mouth. Or at least they should be. How raise them up until they're about level with your forehead. Does this cause any tension in the lats or posterior deltoids? Any pain? If it does, then you're bumping up against one of your potential limitations. You want your elbows very close to directly under your shoulders (relative to forward/aft) in the aero position so that your skeleton is supporting your upper body weight, not your muscles. Now start bringing your elbows together. If you can get them to touch each other without having to PULL them together with your pectorals (chest muscles) then congrats -- you're one of the lucky few that can really use an extreme parallel and narrow hand and elbow position on the bike. For the rest of us, that point where it starts taking some effort to get the elbows together is the limit for how narrow we should go with the aero-bar pads. Okay, at some point you needed to start raising your eyebrows to see. When this happens, you've passed the point of your saddle height relative to the bar pads. Some people will have no trouble with a saddle height that is WELL above the aero bar pads. Some people need to have the pads above the saddle (this is not to say that it can't be optimized, as getting the hands and arms narrow will do near 80% of the job). The neck is why -- the ability to "turtle" (keeping the chin low and forward) and see up the road is the limitation. People often seek a more aggressive position, wanting to get lower in front. I'd suggest that it's a backwards thought process brought about by trying to fit a person to a bike, rather than fitting a bike to a person -- it's more about getting higher in back relative to the bars by strengthening the neck and increasing flexibility. But when one is looking at a bike already in the stable, I can see how this "lower in front" concept comes about. Start with something fairly standard for a road bike seat tube angle, say 74 degrees (which is on the slightly steep end of standard). Do you need to splay out your knees so that they aren't hitting your chest (or other body parts)? Then move the bottom bracket back. What? Move the bottom bracket back? YES! The converse of that is to move everything forward. But those points in space have already been determined, so move the bottom bracket backwards. You will find a point as the bottom bracket moves backwards where the knees track straight, power is at a peak, breathing is easy, and you're not working against your hamstrings. Now add about two degrees. Really. You're going to find that you'll creep forward on the saddle anyway in your aero position, so bring it under you now. If you have a road bike that's dialed in, you'll find that the hip angle will be pretty close to the same on a tri fit. Now you have all the points in space that you need to find the bike that fits your position. If you're trying to fit this onto a bike which you already own, you may find that it becomes un-rideable. This is a sign that the bike is just not configured to fit your best position. Meaning you can do one of two things: compromise your position, or get a new bike. "But what about aerodynamics?" you ask. These things will get you there -- or within 95% of "there" -- trust me. Yes, you could spend a lot of money to get yourself into a wind tunnel and save a few more grams of drag, and likely all it will do is make your wallet lighter and your position less comfortable. If you're only doing short races, then it may be money well spent as long as it's "comfortable enough" for the time you'll be on the bike. If you need to spend 5 to 6 hours or more on your bike in an 140.6, compromising that comfort may be a day-ender. So why are those classic SlowTwitch angles so classic? Because they're a boiling-down of this process over hundreds of riders -- an average of a bunch of positions that went through the trial-and-error process to arrive at a position that takes the above into account. I'll go into the fit of the bike to your position in another post very soon, as it brings frame geometry and stability into play. I'll also chronicle how I landed on the bike I ride now. My own position has evolved over some 25-plus years of riding, learning along the way. It's very compact, with an elbow and shoulder angles that is tighter than a the "classic" position, and my hands are higher. I wouldn't use this position for a long-course race, but my racing is at the Olympic distance and lower. I don't put up my position as an example of what any one else should strive toward, as it's based on my own comfort (for the distances I'm racing), flexibility, and limitations. The idea behind this post is to provide some background base-work understanding to build on for future posts that will delve farther into the reasons for particular bike geometries, and why a certain bike will work well for one person, while being an absolute demon for another. Relax, though. I'm not going to try to make bike designers out of every one, nor make you all into bible--thumping bike fit gurus. But maybe somewhere along the line more information will be a good thing if you're looking at buying a bike for the first time, or even a second time, or looking to check the local bike shops philosophy of doing a fit and finding out that "the best bike is the one we happen to sell". The accompanying illustrations will show you graphically what these terms are relative to the bike itself, and I'll go more into them below. Seat Tube Angle (STA) is quite basically the angle of the frame seat tube relative to horizontal. 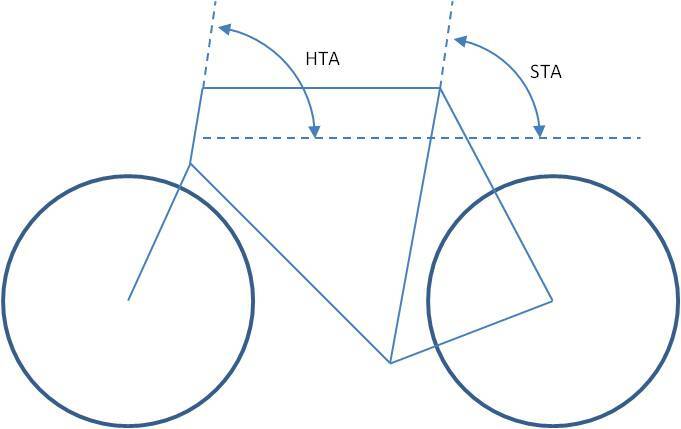 While this is a frame measurement, with things like extreme set-back or forward-facing seatposts, the effective STA of the rider on the bike can be a fair bit different than the frame STA. Chainstay Length (CS) is the distance from the center of the bottom bracket to the rear wheel axle. The shorter this measurement, it would seem that there would be more of the rider's weight on the back wheel, and this is true, but how much is dependent on the rider's position on the bike. Shorter also means more road shock and vibrations is transmitted directly to the bike saddle. But there are practical limitations for this dimension. 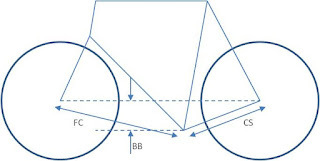 Front Center (FC) is the distance from the center of the bottom bracket to the front wheel axle. As this dimension grows, the steering of the bike becomes more tractor-like -- stable, but with a larger turning radius. Effective STA (of the rider on the bike, not the frame), CS, and FC determine for the most part the weight distribution on the wheels. This, along with a few more factors has a huge bearing on how a bike handles. I'll go more into this in a future post. 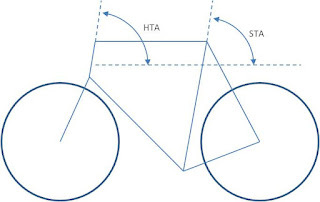 Head Tube Angle (HTA) is the angle of the frame head tube (the steering axis) relative to horizontal. Bottom Bracket Drop (BB) is the distance from the center of the bottom bracket to a horizontal line through the wheel axles. This measurement has a lot to do with how stable a bike feels in a straight line, but there's a limit to how far one can go with BB -- as it increases, stability goes up, but so does the likelihood of scraping a pedal as you power through a turn (with potentially catastrophic results). 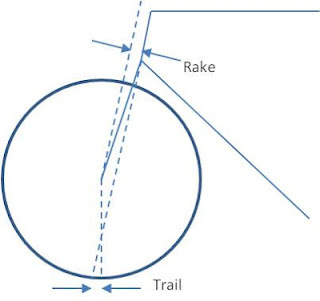 Rake is the offset of the front axle from the steering axis. More rake means a softer ride -- more compliant over bumps. Though, especially with the current generations of carbon forks, the compliance can be built into the fork regardless of the rake. 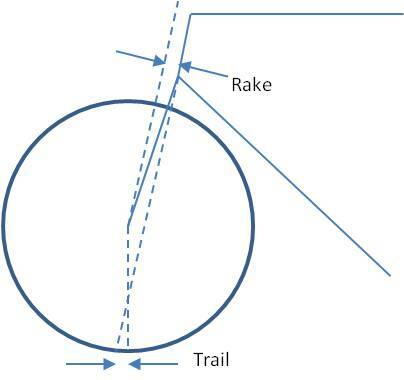 Trail is a resultant measurement of the HTA, Rake, and wheel size. It is the distance between the point on the ground directly below the front axle and an intersection of the steering axis to the ground. Think of it like the front wheels of a shopping cart. There is a fairly narrow range within which trail yields a stable-handling ride, which is one reason that you can't just swap any fork into a frame and get the same feel. 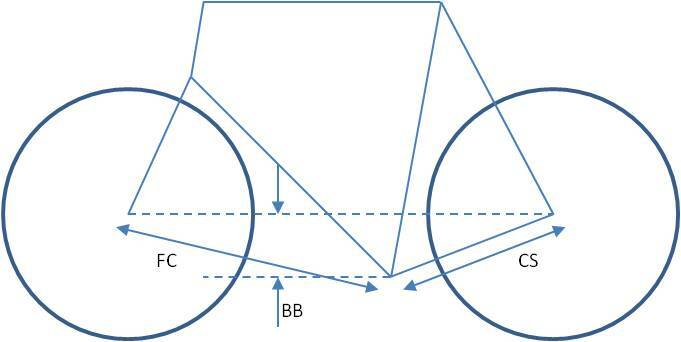 With this basic understanding, we can go further into some of the nuances that affect bike handling, and how this can change drastically when trying to change a road bike into a tri bike, why it's a very good idea to have a professional fit done before buying a bike, and why the 650 wheel size is a very good idea on even some larger size tri bikes. Look for these subjects in the near future! My wife Lisa wraps up her hijacking of my blog for the month of September, adding her own insights into the world of triathlon. ...seriously. Of the 5 sprints I've done I have only enjoyed one. That was the race Dave & I did in June, together. My first race was a huge event. I wasn't ready for the swim. I could swim twice that distance in the pool, but hadn't done any open water swimming. I was sooo glad to get out of the water! I raced on my Huffy mountain bike that I got when before 8th grade. I got passed like I was standing still...a lot! My run was OK, but I didn't run the entire thing. My 2nd race was shortly after my first and it was probably the hottest day of the year. The swim was a little bit easier. I used a different bike, which was a little bit lighter, and I improved on my speed from my first tri. I did start at 8 am or so, but by 10 am while I was on the run, it was hot! I was just glad to be done on that hot, hot day! My training had declined after my first tri because I realized I didn't really "need" to train to finish. My 3rd race was an absolute disaster. It was Memorial Day 2010, in Eastern Washington, the water was sooooo cold I couldn't breathe. I had on a sleeveless wetsuit but that didn't help in the 59 degree water. I hadn't trained that much and got in the water and doggie paddled the entire 1/4 mile swim. The bike was where bad went to worse. I was on an actual road bike! However, I hadn't practiced enough getting into clipless pedals and I didn't know to make sure the bike was in a low gear. The bike route was really flat, except for the start where it went from the water up to the main road. It wasn't a really steep hill, but it was enough that I couldn't get in my pedals and pedal up. I think it took me probably 5 minutes to get started. I was crying the first few miles out of pure frustration and disappointment. Crying while trying to bike fast makes it pretty hard to breathe, FYI. By that time I was mentally done. I walked most of the run and came in 2nd to last. My 5th race was this most recent one. (Yes, I realize I skipped the 4th race...will get to that soon!) I had been training for the Olympic distance but 2 weeks out I realized I wasn't going to be able to do it in the 4 hours that the course would be open. That was the race time limit. The swim was harder than I expected, the bike was actually OK but the run was difficult. I finished and was very disappointed in my finish. My 4th and only enjoyable race...was this past June. As I mentioned, Dave and I did this race together. We did the "retro" division which meant that we didn't use wetsuits and no "tri" specific gear. Prior to this race I didn't complete nearly enough training. I had been swimming 3 or 4 times? I might've "wogged" 5K sometime prior but am not 100% sure of that. Biking? I had been on a bike a few times, riding the couples miles to and from PT and had also taken my mom's bike out for 10 miles the week before. (It was a hybrid bike vs. my road bike.) Since we were in the retro division, our wave was very last. There were 4 of us in the division. I was the slowest swimmer and Dave side stroked along beside me. (He is almost twice as fast as me in all the disciplines.) I'm always glad when the swim is over...and this was no exception. We hopped on our bikes and did 2 loops. We then "wogged" the 5K. We were literally the last to finish. But what made the difference was that I wasn't concentrating on the fact that I was the slowest or that I wasn't going as fast as I should've been going or that I was being passed. I was just enjoying being out there and spending time with my husband. I'm very bad at not comparing myself to others. I don't expect to win, but I also don't like getting passed by everyone. On the bike, I have a lot of time to think about the fact that I could've trained more/longer. I am definitely my own worst critic. So why do I keep doing it?!? Because I need the motivation, as I spoke about before -- I need a goal to shoot for to stay on a training plan, and a race gives me that. However, I think I need to look for a race buddy for my next triathlon! Well it's been fun blogging for September! I realized how quickly days go by and you think - oh! I meant to post! I hope you all continue to read my hubby's blog! I'm sure he has a few ideas for upcoming entries.